Often found in pairs, Shiisa are a traditional Ryukuan decoration from Okinawan mythology and a variation on Chinese guardian lions. 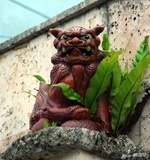 They are placed on rooftops or flanking entrances to houses to protect the house from evil. When in pairs, the left guardian usually has a closed mouth to keep good spirits in, while the right one has its mouth open to scare evil spirits away.